Ten years ago, The Content Wrangler published details about a survey that found most documentation managers don’t use metrics as a performance measure. Has that changed? Have documentation managers stuck to their old, metric-less ways, or have they all become “quants” in 10 years’ time? Join Paul Perrotta, sitting in for Scott Abel, The Content Wrangler, and his special guest, Barry Saiff, CEO of Saiff Solutions. Barry is the author of The Seven Habits of Highly Effective Technical Communications Leaders, and a 30-year veteran documentation leader. He will lead a discussion about the ins and outs of calculating costs and return on investment for documentation projects. 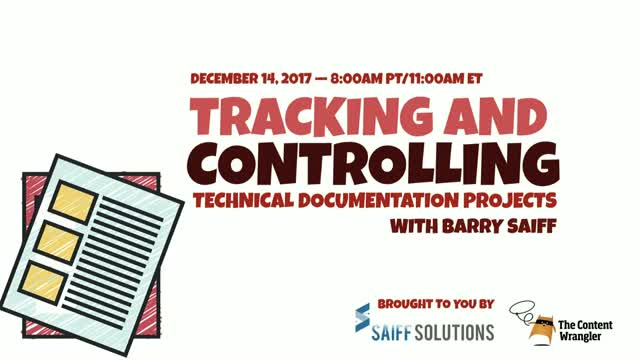 Attendees will learn from the results of a real-world case study of a technical documentation project that required technical writing, technical illustrations, and a couple of key metrics: cost per page and pages per date. You’ll learn how difficult it was for the team to track, calculate, and report these seemingly simple numbers and how they overcame these challenges. You’ll discover the connection between measurement and process design and learn valuable lessons that should help you avoid getting lost in the weeds of data- and cost-tracking.